Clients ask me all the time: have the breast cancer charities sucked out all the oxygen out of the atmosphere for cause marketing during October? That is, can anyone else do cause marketing during National Breast Cancer Awareness Month? I can't give a categorical answer, but here are three quick takes on cause marketing campaigns going on in this month that aren’t about breast cancer, plus a forth that is about breast cancer, only with fewer pink ribbons than usual. 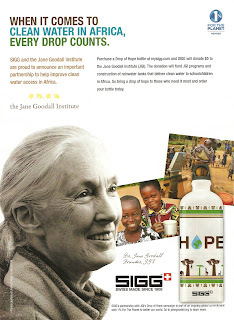 Sigg Drop of Hope Water Bottle for the Jane Goodall Institute. When you buy the Drop of Hope water bottle from Sigg, the Swiss aluminum bottle makers, they’ll donate $5 to the Jane Goodall Institute to build rainwater tanks for schoolchildren in Africa. The campaign is well-timed coming, as it does the heels of news that Sigg used BPA as an element in the plastic liner of its water bottles after first denying doing so. Benihana/Fuji Water Co-Promotion for Best Buddies. Last night at dinner with the fam at Benihana I saw a small sign that said when you ordered Fuji Water with your meal, an unstated donation would be made to Best Buddies. I can’t find anything online about it, although Benihana has supported Best Buddies in the past with a change round-up effort. Weight Watchers “Lose for Good.” Weight Watchers is repeating its successful “Lose for Good” campaign. When Weight Watcher members and subscribers loose weight during a defined period of time from September thorough mid-October, the company donates money to Share Our Strength and Action Against Hunger and encourages members to donate food to local food banks. In 2008 members shed 4 million pounds, donated 1.5 million pounds of food and Weight Watchers donated $1 million. Sharpie Breast Cancer Campaign for City of Hope. Sharpie, the permanent marker brand line from Newell Rubbermaid, is supporting the City of Hope with pen sales and an e-Bay art auction from prominent designers including Rachel Roy, Betsey Johnson, Tracy Reese, Donna Karan, and others. Sharpie markets actively to the artistic and DIY crowd, encouraging them to post work they’ve done using Sharpies on the Sharpie Uncapped website. Given that, it would be cool if Sharpie had figured out a way to integrate their community of users more completely in the City of Hope campaign.